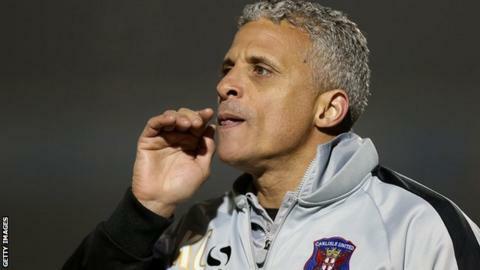 Keith Curle's side are yet to win in League Two this season with two draws and a defeat. Manager Keith Curle hopes his Carlisle United players will learn from the "slap in the face" received in Tuesday's 4-1 defeat by Plymouth. The club took 169 fans on the 389-mile trip to Home Park. But they saw Cumbrians leak four goals for the second game in a row after the 4-4 draw with Cambridge on Saturday. "Options, decisions, footwear and decision-making on the ball are all things that need to be tidied up," Curle told BBC Radio Cumbria. "They've had a slap in the face today to show that players makes mistakes and they get punished." "It was phenomenal and very much appreciated by myself, the staff, the chairman and the owner - everyone associated with the club. You're 4-0 down and the only people in the ground you can hear are our supporters." He added: "Sometimes the pleasing thing is that you need to get punished because if players get away with it they keep making basic errors and mistakes. "The pleasing thing is that they're all things that can be eradicated."